Asian style Maths mastery is taking UK primary schools by storm. Why is this, and what is it? In July 2017, the Government announced a plan to invest £41 million into the teaching of Asian-style Singapore and Shanghai Maths in primary schools in England. The announcement raised many questions, among both experts and novices. I’m lucky enough to have studied and practised Singapore Maths (one of the most popular styles of Asian Maths) for several years and this post is to give you an idea of the principles and benefits of Asian Maths as I see them, and how you might be able to incorporate some of them into your own teaching. Under the recent initiative, more than 8,000 English primary schools will receive funding over the next 4 years and an initial 700 teachers will be trained in Asian-style Maths. Reaction to the announcement has been positive but with a definite level of uncertainty over its likely impact. First lets clarify what we mean by Asian-style Maths. This typically includes Singapore, Shanghai and Hong Kong Maths, which originate from countries who have consistently been at the top of the leaderboard in international studies such as TIMSS and PISA. There are clear differences between each country’s approach (which I will cover in a later blog post) but many of the principles remain the same. This approach works off the premise that ‘all children can succeed in Maths’. This underpins everything and their Maths curriculum has been specifically designed to enable just that. They also adopt the findings of educational psychologists and researchers including Skemp, Piaget, Bruner, Vygotsky and Dienes, to use a technique that focuses on number sense and conceptual understanding before procedural fluency. Typically this is accessed through the CPA approach (Concrete – Pictorial – Abstract), whereby children are taught conceptually through problem-solving contexts, which are initially linked to real-life situations and real objects that they can manipulate. Pupils start by being able to understand and relate to the questions in a ‘concrete’ method. As the pupil progresses in their understanding, the context is then represented in a ‘pictorial’ state (actual pictures of the objects at first, then later moving onto more abstract representations like bar models). The final stage, ‘abstract’ refers to the more formal methods of calculations like column multiplication or the bus-stop method. All these algorithms are linked closely to the conceptual understanding as opposed to taught as a set of procedures or rules to follow. Teaching this way allows children to go back to first principles if they were to ever forget the ‘rules’. Furthermore, procedural fluency is developed and encouraged through investigating many different methods of solving a problem. Through this process, children develop a range of procedures and more importantly, are able to distinguish between, and use, more efficient methods when faced with a variety of problems. Children studying in these South Asian regions are typically taught in mixed ability classes of up to 50 children, yet every child is expected to reach their potential and make good progress through the same activity. You may wonder how this is possible. Surely the more advanced children will suffer from the lack of pace and challenge? How can depth and mastery be achieved? At first, I thought the same, but I was still thinking about teaching in the ‘traditional’ manner. Not only is the teaching style very different, but all activities are designed with ‘low threshold, high ceiling’ in mind – this means that everybody can access the learning, but where they take this learning is up to the individual’s own abilities. Through teacher facilitation, expert questioning and peer discussions, all children are challenged at their level. This enables greater depth of understanding, allowing children themselves to disprove misconceptions that might arise. As much of the learning happens through talk, mixed ability setting actually works better. More importantly, as all children work on the same task, children are not categorised as being lower or higher ability. Pupil confidence and a joy of Maths grows, they finally understand what is going on in Maths lessons! Can Asian-style Maths work in UK classrooms? As mentioned, my own area of expertise is Singapore Maths – they primarily emphasise the use of teaching through textbooks – some may say following a ‘scheme’. I hear your reservations…schemes should be used as a resource which we can dip into from time to time…not follow fully. I would usually agree with you, but in this case, where the textbooks have been designed by a group of experts implementing, researching and refining over the course of many years, then I’m happy to believe that they may have a better understanding of how children learn best and the order of which topics should be introduced to have the most impact. Is it just about the Asian Maths textbooks? So, let’s all just follow the textbooks and every child will succeed…It’s not quite as simple as that. But, provided the right teacher training and resources are in place, the textbooks really do work. The concern at this cash injection from the government is that schools may jump on board and buy the costly resources in a desire to boost progress and attainment, but if they don’t also invest in the substantial training for all staff that is required, they will find themselves back to square one! So finally let’s look at mastery, the longed-for state, where everything comes together: a pupil has conceptual and procedural fluency which enables him or her to link different areas of Maths to solve complex problems efficiently. As the style of teaching focuses heavily on these areas, with slight variations, suddenly this becomes effortless for pupils and they can achieve mastery with greater ease. At one school I spoke to, where they are in their second year of teaching Singapore Maths, the Year 6 pupils actually found the two SATs reasoning papers much easier this year than the problems encountered in class! So, all this considered, that’s why for me, it’s a no brainer…it is the way forward. 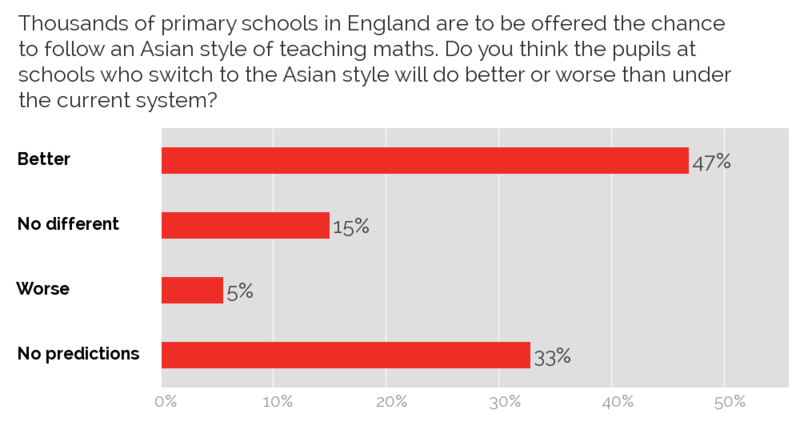 Primary schools who sign up for our one-to-one Maths tuition are increasingly requesting that we use an Asian-Maths approach for their pupils as that’s what they’re used to. I’ve recently been working with our tutors and colleagues to ensure that pupils are still taught with elements of the Asian approach in their one-to-one Maths lessons as well as back in class with their teacher. This is just part of our process of continually reviewing our Maths curriculum, resources and the CPD for tutors at Third Space to check that it is meeting school’s current teaching needs. When what we’re doing directly impacts over 3500 pupils each week it’s important that we get it right. Want to know more about a Maths Mastery approach? Read our blog post: The Beginner’s Guide to Becoming a Maths Mastery Expert.